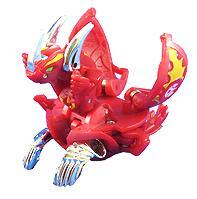 Lumino Dragonoid is a humanoid, dragon Bakugan, and is the evolution of Helix Dragonoid. Lumino Dragonoid partners with Dan. He is a quadruple-shiny-winged evolved form of Drago and has a double bladed tail. Protecting his chest is a super strong v-neck armored plate. Lumino Dragonoid unleashes a powerful flame from his mouth and double charges it into a fearsome fireball. His Battle Gear is Cross Buster. Purchase your Lumino Dragonoid from Amazon now!